I just came across a blog by a diver in Australia (Read it here). He’s an interesting guy, with obviously a lot of experience. Initially, I stumbled across it trying to find out how much actual diving experience Dave Shaw had prior to losing his life in a South African cave. Turns out, not a lot, but that’s a topic for another day. On his blog, there’s a section chronicling a number of diving accidents. These always get my attention because there are lessons to be learned (or reinforced) from every incident. 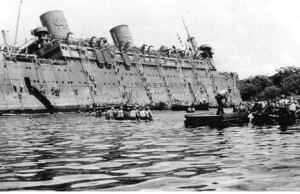 One such accident involved a woman named Laila, who didn’t make it out of a shipwreck, the SS President Coolidge, in Vanuatu. Based on the description and accompanying photos, her skills underwater were clearly weak. Consequently, fingers generally pointed to her as the primary cause of her own untimely demise. Since I believe people make their own decisions, that’s probably true, but, something struck me about this particular diving accident. It isn’t that another unskilled diver perished in an environment where she obviously didn’t belong. Rather, it is the way diving on this wreck is described as being managed overall. Let me outline the situation as I understand it. Only a few dive operators have access to this dive site, and unless you book through one of them, and hire their guide, you aren’t going to be allowed to dive there. It’s a shore dive, but it seems the property is private. Fair enough, but it’s how they are said to conduct these dives that is frightening. Depths can range in excess of 180 feet, if I remember right, so these guides (many of which, according to the author, are not certified as Dive Masters) place stage bottles in what’s called the “deco area” and regularly conduct deep penetrations with divers that, from what I can tell, are not required to have decompression or wreck penetration experience. Based on the information provided, deep stops (“deeper and longer than typical”) are employed and no diver is allowed to ascend to a shallower stop or surface before the guide signals it is OK. The dive plan itself is said to have been worked out using “very conservative tables,” but exactly what that means wasn’t defined. All this is presented as normal and safe. A topic that is commonly discussed in courses, from Open Water through Tec, especially during Tec training, is the concept of the “trust me” dive. These are dives in which untrained or inexperienced divers follow others into dangerous situations, on the assumption that the leading diver is equipped and prepared to get them safely back to the surface when something bad happens. The author, at one point, mentions “technical” divers in quotes in a way that I took as condescending, which surprised me. There was also what I read as a jab against divers using doubles in recent years as the preferred kit for exploring the wreck. Huh? The reality seems to be that these dive operators are conducting challenging dives with untrained divers as a matter of policy, and passing the practice off as safe, based on the undocumented “experience” presumed by the guides. Like every other trained technical diver, there is no way I would do a deco dive in any environment without generating my own deco profile and planning for, and personally analyzing, every gas I am about to breathe. On top of that, neither would I do a dive without the equipment configuration (doubles, redundancy, etc.) that is appropriate for the type of dive. As I see it, here are just a few of the factors that make these dives on the SS President Coolidge dangerous. ⁃ Divers are not required to be equipped or trained to deal with issues on their own, and a direct ascent to the surface is not possible once a decompression ceiling exists. ⁃ Dives are conducted using standard, recreational scuba gear. No redundancy means no backup in the event of even a minor equipment failure. ⁃ Insufficient gas. Laila repeatedly breathed her single cylinder down to the last few PSI, yet kept diving using the same kit. ⁃ No gas reserve. Divers are swimming around using turn pressures appropriate for safety stops, but not for deco stops. ⁃ Divers could be breathing anything. Every diver should personally analyze every breathing gas and label the cylinder as his/hers. Nothing in the blog indicates this is happening. ⁃ No agreed upon dive plan. With technical dives, a lot of energy goes into planning the mission. Make no mistake, these are technical dives. The proof that these dives are dangerous is that a woman died because she trusted her guide. Had she been required to demonstrate the proper training and experience, she would not have been allowed to dive. She might be upset, but she would be alive. Interestingly, a news piece was published locally (Read the story) that describes the events surrounding the incident very differently than outlined in the blog. Obviously, I wasn’t there. I’ve never been there. And, I don’t know any of the people involved. Based on his other blog posts, the writer is most certainly a skilled diver, and I agree with his opinion about Dave Shaw’s death, tragic as it is. I didn’t see anything on the dive operator’s website or other source to make me think that dives are conducted differently than I am lead to believe. That said, I don’t have all the information. I can’t possibly get all the details of everything that goes on with a diving operation half way around the world. Regardless, it underscores just how significant a responsibility it is to coordinate and lead dives. As a scuba instructor, diver’s put their faith in me to get them safely in and out of the water. It is my responsibility to recognize when a situation may be unsafe and take the appropriate measures to make sure no one gets hurt. Sometimes that means not diving. Based on the news piece about the incident, the deceased diver was a competent “rescue” and “deep” diver. But, the blog describing the same incident has actual photos. Fact is, she wasn’t a competent open water diver, let alone rescue or deep diver (I am an instructor for both). I don’t care what specialty certifications she carried, she looks in the pictures just like the hundreds of students I’ve taken on their first open water dives—vertical in the water, thousand yard stare, no indication of situational awareness, the list goes on. Laila was going to dive, but there’s one picture online showing the very same guide with her after clipping on a stage bottle when she ran dangerously low on air. He knew what her skills were like and took her anyway. Maybe he was getting pressure to serve a paying client, or maybe he was just going through the motions. Maybe, she did turn back and re-enter the wreck on her own. Who knows? The guide took her deep. The guide took her inside the wreck. The guide is the one person with a direct duty of care while the dive was taking place. He decided how deep they would go, and whether they would remain outside or penetrate the wreck. Allegedly, there was evidence of Laila desperately trying to claw her way out. Not pleasant. Had she not been inside in the first place, she’d almost certainly have bolted to the surface. She might be bent, but in my view, time in the chamber beats time in a coffin. The blog post places the majority of blame on the victim, and there’s certainly responsibility there, but it’s the guide who took responsibility for all aspects of the dive. He took her inside knowing she was a weak diver. Draw your own conclusions, but if operators really are conducting dives as I understand them to be, this death won’t be the last. 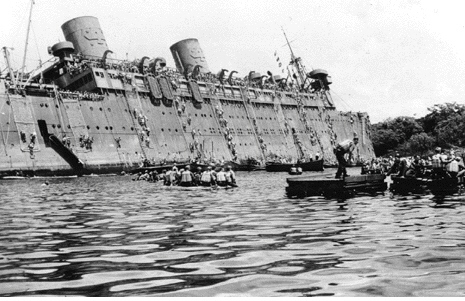 This entry was posted in Dive Sites, Diving Safety, Technical Diving and tagged diving safety, shipwrecks, ss president coolidge, technical diving, wreck diving. If you happen to know Pete Wederell of Vanuatu Total Marine Solutions, please get in touch with Pete. Pete has facts of scuba diving laws enforced by February 1, 2017 in Vanuatu. He shared with me information of Aquamarine Santo failing 3xs to be accepted to Vanuatu Scuba Divers Association. Vanuatu Scuba Diving operators must comply to the international scuba diving standard and will enforced laws to scuba diving safety standard to obtain a license to operate. Rehan Sayed is not visible in Vanuatu. Republic of Vanuatu Ministry of Justice must exercise the prosecutorial law to Rehan’s business May 2, 2013 total lack, total disregard to safety causing unnecessary, preventable, avoidable scuba diving death. Preventable scuba diving death does not turn COLD. I don’t know Pete, but I will try to reach him. I’ve become very interested in diving practices in Vanuatu. I hope you’ll keep in touch. I’ll be sure to post anything I learn here. There are safe operators in Vanuatu doing the Coolidge the right way. You can save money and dive with a guide to 60m on air because thats what the customers want or you can pay a little extra and dive with tech trained guides with doubles and slung bottles. Look for a good operator – Coral Quays offer tek and gas blending – one example of how the coolidge can be a perfectly safe dive. Of course, there are safe dives you can do on the S.S. Coolidge. I can even accept that there are experienced technical divers that can pull off 60m (197ft) dives on air. I know that’s a fairly common practice in warm water locations where helium isn’t available. However, common or not, divers simply do not think clearly at those depths breathing air. If I understand you correctly, you’re saying that recreational divers are going to 60m on the Coolidge believing it is safe because they “want” to? Also, because they have a guide. These are the dives I’m concerned about, and you seem to be confirming my suspicions about how such dives are run. Just because divers usually survive these dives doesn’t make them safe. As depth increases, you dramatically reduce the amount of time you have to deal with emergencies. Once you incur a decompression obligation, the surface is no longer an option. Technical divers carry reserve gas and backups for everything critical. Recreational divers don’t. Technical divers are aware of, and trained to deal with emergencies on the bottom. Recreational divers aren’t. I’m sorry but I simply cannot find a way to justify taking recreational divers far beyond the limits of their training and experience. It may well be what customers want, but that certainly didn’t make it safe for Laila. Read: Quick Facts+ Destination Descriptions- Local Laws-Special Circumstances. Recreational Diving Precaution clearly posted US nationals to be cautious of Vanuatu’s lack of safety standard to scuba diving industry. These were added after Laila’s avoidable diving death with Aquamarine Santo in Vanuatu. I was on a dive trip when you posted this. On the 5th, the day after your post, I checked and saw that precaution. Now when I look, there seems to be a more benign, general warning about diving safety overall. I wanted to post that link. If you can find it, would you please pass it along? Thank you for keeping me up to date. I have no problem with diving in Vanuatu, but I have a major problem with divers being encouraged to dive far beyond the limits of their training and experience. Hopefully, we can help some divers make better decisions about their capabilities before getting into the water. I just came across your blog after having similar thoughts about the Coolidge myself. I’m also an instructor currently teaching an advanced open water course to a student who did her open water in Vanuatu. On checking her logbook, I found that she did her 4th open water dive to 44 metres and her 8th to the swimming pool at 50-55!! Of course she had absolutely no idea of the implications of that sort of diving. Frankly I’m astonished that awful cases like Laila’s aren’t more common there. The Coolidge looks like an incredible dive, and it’s very high up on my ‘must dive’ places, but it is unquestionably a technical dive and to take students there who are totally unaware of the actual risk they are undertaking just blows my mind – and that’s just open water diving to that depth, adding wreck penetration into the mix is just beyond words! I am frankly quite mystified as to why this isn’t considered a bigger issue by the agencies? Just to add in, in relation to your earlier comment, that NAUI also has an online dive professional verification system. Thanks for your input. I have been very careful not to state my understanding of diving on the Coolidge as anything beyond conjecture. Like you, the wreck is pretty high on my list of dives I’d like to do. But, I wasn’t there and have never been there, so I only know what I hear. Log book entries are pretty compelling. Instructors have to sign off on those, and no agency I know of would let a 55 meter dive take place at that level without conducting a major review. 55 meters is considered by most, the absolute air diving limit for very experienced technical divers. The air MOD is less than 2 meters deeper than that! Even at a high descent rate, there’s no practical way to bounce a dive to that depth without incurring a deco obligation. I’ve had a lot of people contact me since I made that original post, including members of Laila’s family, with first hand knowledge of diving practices on the Coolidge. Based on these first-hand accounts, I believe what’s going on down there with some operators, is grossly negligent at best. It’s easy to blame Laila for making a poor decision, but a big part of our job as instructors is to do everything we can to keep our divers from diving beyond their skill level and training. I’m with you. I can’t imagine that such tragedies don’t occur more often. Meanwhile, I’d love to hear from someone who actually conducts these dives. Hi Joe, I just did a 62m dive on the stern a few weeks ago and my buddy and I were ribbed constantly by our fellow highly experienced divers for sidemounting two tanks when everyone else was on singles, we couldn’t believe anyone would argue against more air and redundant regs at that depth. It did eventually stop though, right after a 58m penetration dive saw us exiting the hull at 53m 20mins with 61 minutes TTS. My final runtime was 101 minutes on a single-tank trust-me dive, and I spent 80 minutes hanging there sipping on my twins watching bottles being passed around and shared with regs dangling all over the place. Turns out skipper jumped in to see what was keeping us and immediately phoned for another boat full of tanks. I’d happily dive with them again though – that particular guide screwed the bottom time up but all in all I think they should be able to expect divers to prepare for and understand a dive of this nature when they sign up for it. But no way should they take OW divers that deep, and they need to be encouraging two tanks. Wow! That’s a deep long dive, especially on air (I’m assuming). It sounds like a great dive that I’d love to do. But, I’m like you. I wouldn’t dream of doing it without doing my own gas calculations, carrying my own reserve, deco gas, etc. It’s the “trust me” component that I am uncomfortable with. In my opinion, OW divers have no business being down that deep. Heck the MOD for air is 56.6m (187 feet). I’m curious, did any of the OW divers have any idea what their deco obligation would be at the end of the dive? Thanks for the info. I’d love to learn more about your experiences there. Hi, it’s a magnificient wreck, I wish I’d done it before the earthquake shook the last of the superstructure off but I only started diving in March 2014, and this was just my 108th dive – so yup, it felt deep and long to me alright, I’m pretty new! Not the newest though, one of our guys was OW-only with around 25 dives, he wasn’t on the long dive but did 60m at some point on a single. Yep it was plain old air, rounding the stern my comp showed PPO2 1.49 in the video, I could have stayed shallower but didn’t – maybe I was narced after all, didn’t feel anything but 1.49 is silly. The general feeling after the longer dive was that our guide was looking narced – that has to be as good a reason as any not to put all your faith in someone breathing the same air as you at these depths I guess. He kept making machine gun noises to illustrate at the bullets we were holding would have sounded like if they were ever used lol – lovely guy, I think he was too eager to show every diver every little thing while we were there and to give us the best time, but time wasn’t something we had a lot of really. From the way some of the guys joked about the slower divers the previous day that some of them knew the importance of minimising our bottom times. The briefings should probably have emphasised the need to keep up in hindsight. On the other hand if you prepare and take responsibility for yourself you couldn’t ask for better guides, what an amazing ship. The dark hold containing aircraft drop tanks probably blew my mind most of all – remember the first Alien movie..? They looked exactly like those eggs as you cast your torch across them in the darkness.. gaaaah! I really enjoyed reading your blog. I also took interest in this matter after learning of this incident. I am not a diver, but do wish to visit the New Zealand islands and will at some point consider some excursions. As an American, we often get lost in the protections we have as citizens. Here, companies and business men are held accountable and are liable for services offered and rendered that place others in jeopardy that otherwise could have been avoided. It appears as though this may not apply or be the case in other countries. So my question becomes, for a person who wish to go diving who places his/her life in the hands of someone who considers themselves to be an expert, shouldn’t the expert be the deciding factor as to whether to conduct the dive. What I’m asking is this — If I want to dive, but have no experience and will probably panic at 40ft and drown, are you going to take me diving anyway? It’s like going to the doctor’s office when you’re sick. You listen to the doctor because he’s the expert. We depend on the experts because they are in fact the experts (more experience, more knowledge, and we hope – the ability to make decisions to protect our welfare). Experts became experts because once upon a time, they themselves had to make their first dive to 140ft and probably had the support to do so. So, all that being said, my final question is this — if the so called diving qualifications of the experts are in question meaning whether or not they even had the qualifications of an expert to conduct that kind of dive, why would they care to question Laila’s qualifications to dive? Shouldn’t there be someone or something to regulate this? That way, someone (the diver or the guide) can be held responsible when the rules are not followed and these things happen. There has to be some accountability. And, in this case, I believe it is with the company in a county with no rules. You make some excellent points. In general, scuba diving has an incredible safety record. This is because the diving industry has, for decades, done a fantastic job regulating itself. Global organizations like PADI and DAN have set a very high standard that is recognized virtually everywhere. So, when you make that trip to New Zealand, diving with a PADI affiliated shop or resort will ensure that a high standard is being maintained. So, to answer your question, yes, it is being regulated, so long as guides play by the rules. But, as I outlined about Vanuatu, there is some question about whether the guides are, in fact, trained to function in that role. In the end, it’s no different than driving. Can you drive without a license? Sure. Is it regulated? Absolutely. Do people do it anyway? All the time. The good news is you can check the credentials of anyone claiming to be an instructor or divemaster. Every PADI professional has a certification number, that he or she probably knows by heart. Ask for it, then go to: http://www.padi.com/scuba/prochek/. When you enter that number, within seconds you’ll see what credentials that PADI Pro has, and whether or not he or she is currently authorized to tech or act as a guide. I’m sure by now I have upset our NAUI and SSI friends by only talking about PADI. There are other reputable training agencies, but as a PADI instructor, I’m simply not familiar with everything they offer. PADI is, by far, the largest. The bottom line is, not all dive operators live up to the same standard. However, PADI ProCheck works everywhere in the world, so you DO have a resource for checking the credentials of those you are about to dive with. All that said, I personally change dive plans all the time, based on what I observe in terms of skill level. If I have any question about an individual’s ability to conduct a dive safely, I change the plan. In the extreme, that might mean no dive. I’m sure Laila really wanted to do those dives, and she was a paying customer. Despite the pressure, the right decision would’ve been not to dive, but that’s all hindsight. Also, there are rumors that Laila made claims that she was a divemaster herself. (ProCheck would’ve revealed that she wasn’t, BTW.) So, there’s a lot to this story that we simply don’t know. What we do know, is that this was a horrible tragedy that appears to have been avoidable. I am Laila ‘s mother. Thank you for including Laila’s tragic diving death in your BlogPost.It is about time for a country like Vanuatu promoting Scuba Sport as a major draw absence of commercial diving and underwater sports safety standard must be exposed. Vanuatu has no legislation to enforce scuba safety standards and ethical treatment to scuba deaths. Break the total silence in Vanuatu disregarding scuba safety standard. And again, thank you. From a mother. I am truly sorry for your loss. Often, experienced divers tend to blame the victim, without fully realizing that circumstances are rarely black and white. In all honesty, that was my first instinct with your daughter. But, the description of the accident bothered me, which is when I sought out newspaper articles and other sources. In reality, I know very little about the incident, so I can only offer my opinion and speculate about what might have taken place in Vanuatu. However, the fact remains that Laila was doing a deep, penetration dive into a wreck; apparently without the requisite training and experience required for such a dive. On top of that, the blog article I referenced indicated that the dive “guides” are not actually certified divemasters. So, what are they? How are they selected? What actual training do they have? In the end, I am a firm believer that people must weigh the risks and decide whether or not to dive. But, it is easy to understate the degree of risk, and I suspect that happened here. Deep, decompression diving into wrecks is serious business, requiring extensive training and experience. On the whole, the dive industry has an incredible safety record. My hope is that, after learning about Laila, divers will be better equipped to recognize when a dive may be inappropriate. You got your point. But, as of this time, I rather remain neutral as I have not heard the point of the one who guided her. I am so sad for the accident. Julia, you’re right. I don’t know any better than you do what really took place leading to the accident. I’m sad for the same reason. I almost didn’t post my comments. But, if people really are trusting the guides to keep them safe during deep penetration dives, I hope they’ll think twice. As a rebreather diver, you know how much training and preparation goes into being safe under such conditions. A recreational diver doesn’t have that, and I fear this tragedy won’t be the last.